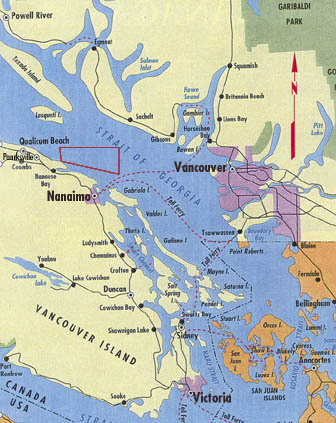 For 35 years, Ottawa and BC have allowed torpedo testing near Nanoose Bay in the Georgia Strait. Most of the torpedos are American, and some of the US vessels that visit the site [ outlined in burgundy ] are nuclear powered and nuclear weapons capable. Last year, the BC government decided not to renew the lease. The Chrétien cabinet, furious, decided to expropriate the test range; a hostile take-over. Polls show that most Canadians (over 90 percent) want to see nuclear weapons abolished; they are against keeping the Nanoose range open, because they see it as part of the nuclear weapons infrastructure of the USA.
. . . to see any article, click on the date in front of it. Aug 06/99 - Hearings: Pediatrician on medical effects of radiation - Dr. Sylvia Keet, MD.